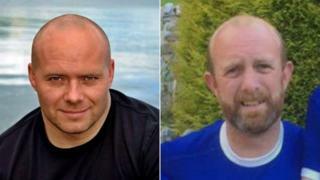 Fresh efforts have been made to locate the bodies of two fishermen lost in a sinking on Loch Fyne. Their vessel, the Nancy Glen, sank on 18 January. One member of the crew was rescued by a passing boat but Przemek Krawczyk and Duncan MacDougall, who both lived in Tarbert, were lost. The Marine Accident Investigation Branch (MAIB) were surveying the site to decide if the wreck can be raised. A candle was lit for the lost men at a ceremony in Tarbert on Saturday. Elaine Whyte of the Clyde Fishermen's Association said the situation had been hard on the families of the fishermen. She told BBC Radio Scotland: "It's the families that we all feel the most keenly for. "Everyone just wants to get the boys home but it's hard for families with young children as well to try and explain what's going on. "And the longer it goes on, the more prolonged it becomes, the harder it is." Ms Whyte said she understood investigators were planning to carry out a sonar sweep of the area where the wreck lies and were considering using a remotely-operated underwater vehicle (ROV). The information gathered would form the basis of any plan to salvage the vessel. Coastguard volunteers carried out searches of the shoreline on both sides of Loch Fyne following the accident. That operation ended on Saturday. The fishing community has appealed for funds to ensure every feasible effort is made to locate and recover bodies from the wreck. More than £200,000 has been raised through online appeals. Ms Whyte added: "We started that fairly quickly when we were sure that the families were happy for us to do so. "We became very aware that if the MAIB were not going to be in a position to lift the vessel that it was going to cost quite a lot." She said that, if official funding was made available to recover the vessel, the funds could be released to help the families of the men lost. "I guess it would be my preference that it goes towards helping the families and the young children affected and possibly that we receive some help from either the UK or the Scottish government to raise the vessel," she said. As investigators prepared for Monday's survey, an MAIB spokesman said: "The Northern Lighthouse Board vessel NLV Pharos will be conducting a multi-beam sonar survey of the wreck of Nancy Glen for the MAIB next week. "This is planned to take place on Monday, although it is dependent on weather and sea conditions on the day. "Pharos has hull-mounted equipment that operates from the surface to map the seabed and potential obstacles around the wreck, which is lying at a depth of over 140m." He added: "Currently, we do not anticipate that we will need to raise the wreck of Nancy Glen as part of our safety investigation."